The early 1980s continued to be turbulent times for British Leyland. Much needed financial backing from the government was not proving easy to obtain, whilst most of the workforce were virtually being employed to go on strike and steal things (or so it seemed). During the reign of Michael Edwardes as chairman the company appeared to be trading under a different name every few weeks, and as the number of Marques under BL was reduced and the company split Austin Rover came into being, with the appointment of Austin ex-apprentice Harold Musgrove as Chairman and Managing Director. The appaling state of the company was also reflected in the design side of the operation which was vastly underfunded and consisting of demoralised staff. 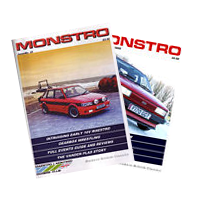 One of the first things Musgrove did was to back a full reorganisation of styling within the Austin Rover Group and a new design studio at Canley (near Coventry) was invested in. Unfortunately this was too late for LM10 the Maestro, the most immediate project on the horizon at the time. The Maestro launch was delayed by BL’s first collaboration with Honda, the Triumph Acclaim, a version of the Honda Ballade (nee Civic), which was introduced in late 1981, and as such the design essentially came from the late 1970s, but despite being a three year old design by the time it was launched the Maestro still managed to maintain an attractive and purposeful appearance in the eyes of many.